Microsoft published a new Insider Preview build today to the Fast Ring channel that brings the build number of Windows 10 to 17035. Work on the next feature update of Windows 10 began some time ago, and new features and changes are slowly being introduced by Microsoft. Windows 10 Build 17035 features a couple of interesting changes that highlight some of the things that will likely land in the next feature update version of Windows 10, out March 2018. Microsoft Edge has a couple of new features that are worth mentioning. You can save free ebooks that are open in the browser now with a click on the new save button. While that was possible previously as well, it involved right-clicking on the link that pointed to the ebook to save it using "save target as" from the context menu. 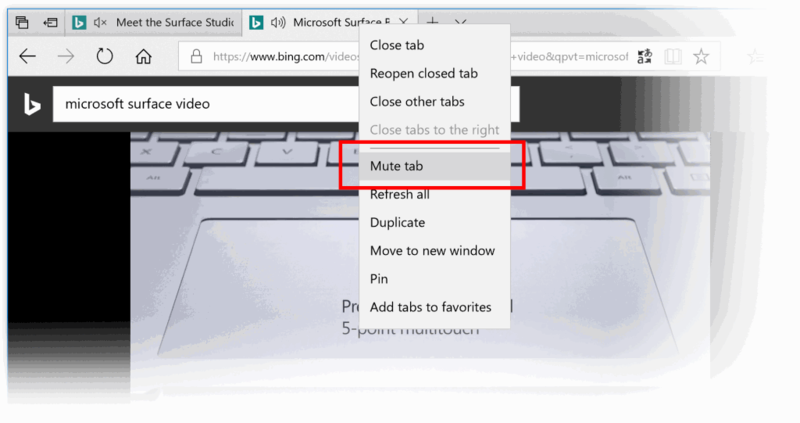 Another Microsoft Edge related change is that you can click on the audio icon of tabs in which media is played to mute the audio directly. This acts as a toggle for audio playback, and will enable playback again when you click on the icon a second time. The option to right-click on the tab to select mute tab from the menu is still there as well. Microsoft did add new options when you right-click on ebooks in Microsoft Edge. These new options include opening the book in the Microsoft Store, pinning it to the Start menu, and refreshing books. Windows 10 build 17035 features a new "near share" option which adds an option to share files and URLs wirelessly with devices that are nearby. The feature works only for PCs with Bluetooth, and users who want to make use of it right now need to enable it under Settings > Notifications & Actions > Add or remove Quick Actions. Work on the Settings application continues. Microsoft revamped the Settings application several times already in the two years that Windows 10 is out, and there is no end in sight for that. The company moved some of the Sound settings from the Control Panel to Settings. You find those listed under Settings > System > Sound. Microsoft notes that this is a work in progress and that things still need to be added and fixed. An option to limit the foreground downloads bandwidth for Windows Update downloads has been added as well to the Settings. This allows you to limit the bandwidth of update operations when you initiate those, for instance when clicking on the "check for updates" button. The third and final Settings change brings an update for the ease of access settings. New sections are available in Display, Audio, Speech Recognition and Eye Control. Touch keyboard has an acrylic background in this build, and supports more than 190 different keyboards. The handwriting panel features new animations, and a new button layout. Word recognition has improved, and a new gesture is available to create more space between words (by drawing a split gesture). Japanese IME supports test suggestions from the AI chatbot Rinna in that build. Text suggestions while typing on the hardware keyboard. You can check out Microsoft's extensive "what's new" article for the full run down on features and changes in that build. Microsoft published a new Insider Preview build today to the Fast Ring channel that brings the build of Windows 10 to 17035. NB The sentence above is meant to be humorous !